What are the hidden meanings? Note the body language, especially the hands and body position. Everything has a message. 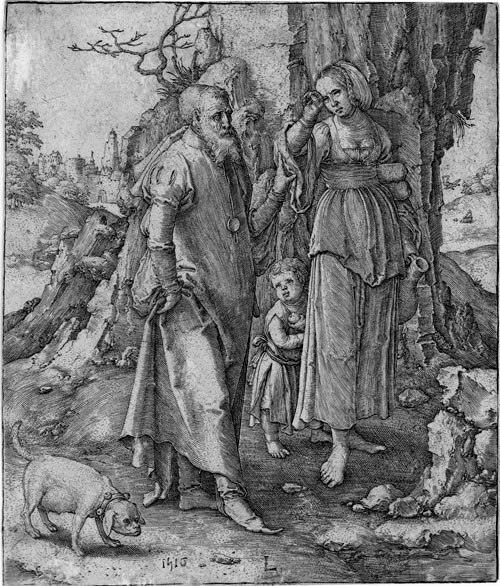 Sarah offers an uncertain Hagar to her husband Abraham. Any child resulting from this union would belong to Sarah, since Hagar was her personal slave. On the other hand, if Hagar plays her cards well she might become the favored concubine of the tribal leader, rather than a mere slave. See Slavery in the Bible for information about slaves and rules governing their treatment. The rich fabric of Sarah’s gown and the voluptuous red of Hagar’s says it all. Sarah has power and wealth. Hagar has youth, sexual allure and an unborn child. Clearly, Sarah cannot stand the sight of her. She drives her slave out like a stray dog that has overstayed its welcome. An ineffectual Abraham stands half-in, half-out of the doorway. Rubens excelled at painting voluptuous goddesses and here are two more of them, albeit in the form of biblical heroines. The painting is in-your-face sensuous, with human passions all too visible. Rubens’ luminous colors suggest the emotional energy of the scene: Sarah’s murderous jealousy and Hagar’s perplexed, conciliatory gesture. Tiepolo’s beautiful, terrified Hagar begs for mercy, but Abraham is unyielding: she must leave, and leave now. He towers over her prostrate figure: he is the one with the power and she, despite her beauty, has lost the influence she once had. The background details of the painting seem curiously wrong for nomadic tribes-people, but they do suggest the wealth and power of Abraham, and the almost divine status of certain biblical figures in Western culture. As a painter, Tiepolo was an international star, famous and pampered by the royal courts of Europe — the 18th century equivalent of a rock-star. This painting was cut from a larger canvas, so we have only part of the original scene. Is this Hagar’s first flight from Sarah, or is it fourteen years later when she is cast into the desert with her son? 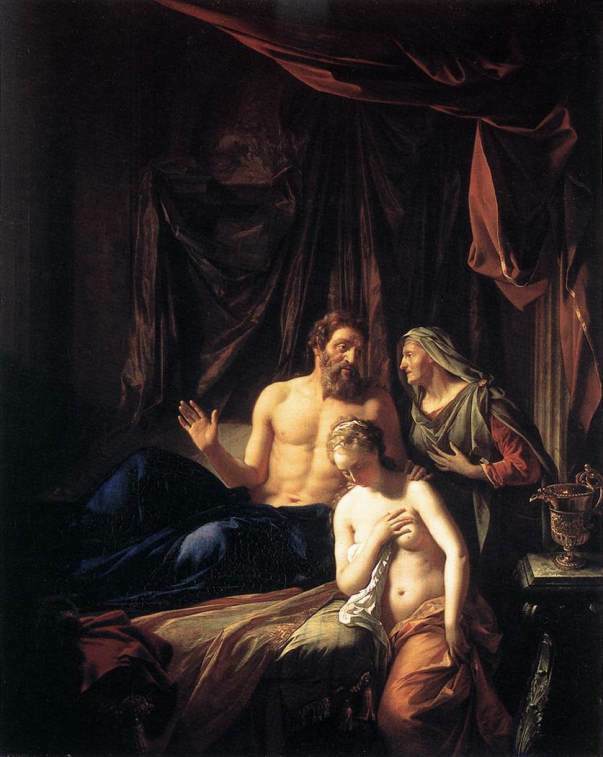 I would guess it is the former, since Hagar seems to be a young girl in this painting, rather than a mature woman. She is turning to look up at the angel behind her, the positioning of her beautiful hand suggesting that she is taken aback by what she sees. Van den Eeckhout was another of Rembrandt’s pupils, probably studying with him in the late 1630’s. But the style of this painting shows he had moved away from Rembrandt’s influence and was painting images clearer and more precise than his teacher’s. Hagar, almost lost in the immensity of Nature, senses the presence above her of a messenger from God. There are storm clouds ahead. She looks upwards, straining to understand what the Angel is saying. The Angel urges her away from the towering rock cliff, back towards the clear blue sky and the land she has fled. One of my favorites. Poussin, one of the greatest Baroque painters, was a poor boy made good. Born to an impoverished family, he trained in Paris then went to Rome, where he lived for most of his life. He returned briefly to Paris and was honored by Louis XIII, but the bitter jealousy that this caused made him decide to return to Rome in 1643. During his lifetime he was a respected intellectual, and after his death he influenced painters such as Jacques-Louis David, Cézanne and even Picasso. Some interesting trivia: one of Poussin’s main patrons was Cardinal Richelieu, whom most people know as the villain in Dumas’ ‘Three Musketeers‘. 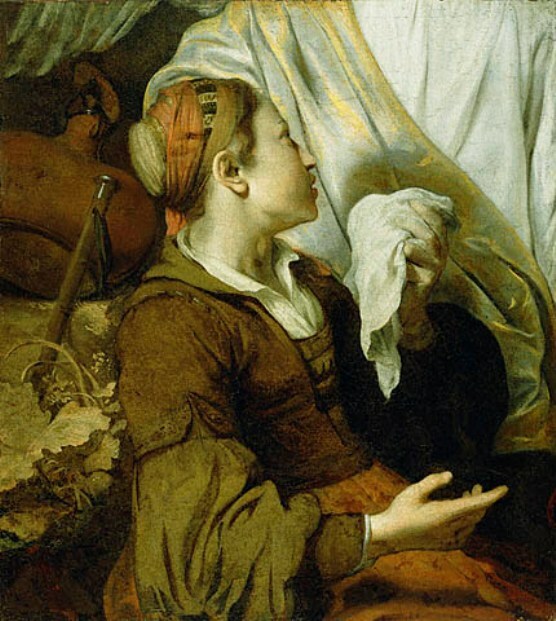 Hagar’s face shows exhaustion and weary reproach, her eyes swollen with crying. Her little child cowers behind her for protection. Interestingly, it is not only Hagar and her little child who are suffering – van Leyden has given Abraham an expression full of doubt and regret. Though he made some paintings, van Leyden was mostly known for his engravings, which were of remarkably fine quality. He knew Dürer, who made a drawing of him, and was admired by Rembrandt. His mastery of perspective is superb – look at the depth he is able to achieve on the flat surface of this picture of Abraham and Hagar. 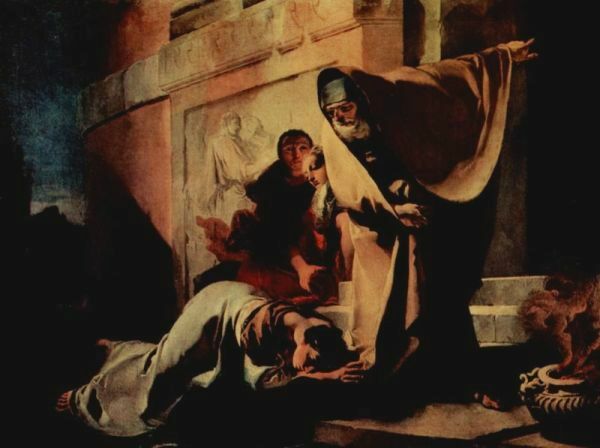 Abraham expels Hagar and her son from his home, a piteous scene, but notice that she is moving away from darkness and towards light – this, despite the apparent hopelessness of her situation. Sarah stands at the doorway, a mean-spirited gleam in her eyes. Victors painted biblical scenes for Calvinist (Protestant) patrons, pictures infused with his own religious beliefs and designed to encourage enquiry and discussion. He used rich colors and theatrical settings to engage the interest of viewers and lead them towards awareness of God’s continuing constancy and protection. After the mid-1650’s, Victors did a surprising thing: he gave up painting to devote himself to caring for the sick, and he died in the East Indies (modern-day Indonesia) in 1676. 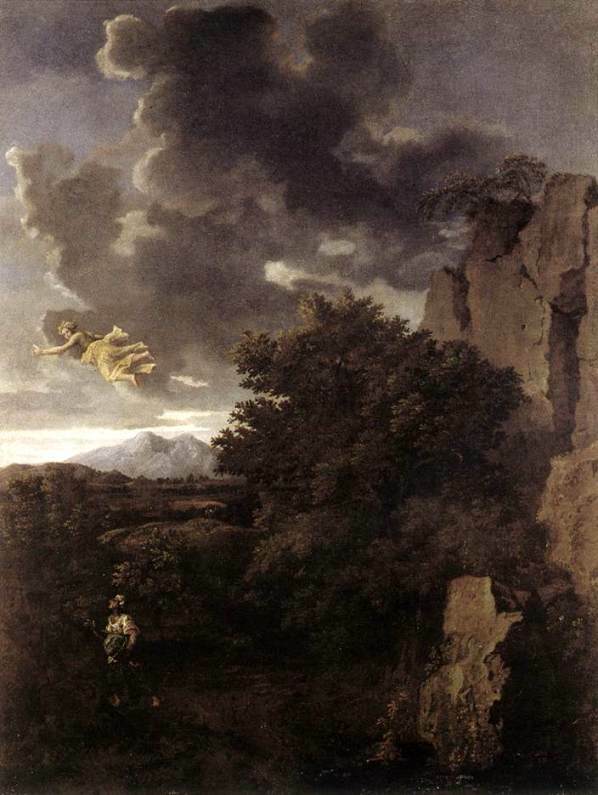 ‘Abraham Casting Out Hagar and Ishmael’, Il Guercino (‘the man with the squint’). Abraham raises one hand in a gesture of rejection. With the other, he points in the direction that Hagar and their little son must go – out into the unforgiving desert. 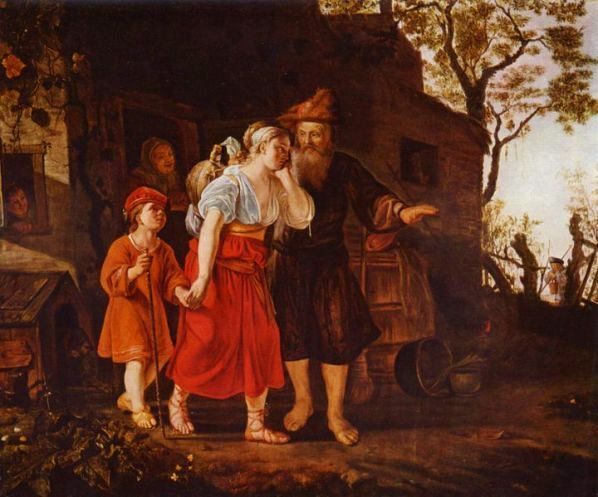 Hagar looks reproachfully at Abraham – she knows she and her child are being treated unjustly. Sarah pointedly turns her back on what is happening. Il Guercino’s paintings are like watered-down Caravaggios. They have luscious colouring and consummate technique, but they somehow lack the impact of a Caravaggio painting, that ability to reach out and smack us in the eye. Nevertheless, they are beautiful, balanced, and perhaps more quietly thought-provoking. Notice the graceful curve of Hagar’s body. 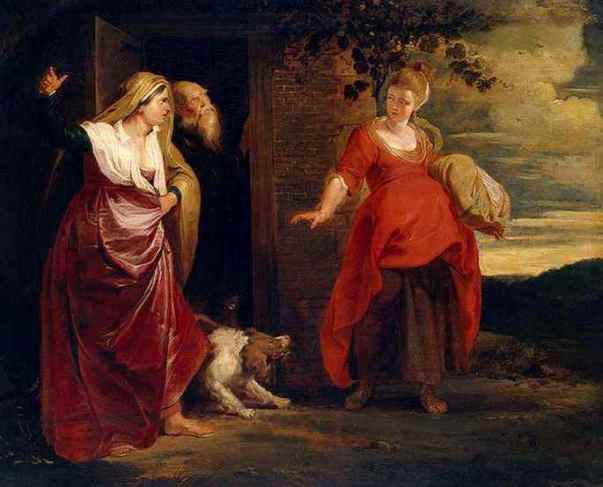 Abraham reaches out to her as she moves reluctantly away from him. Sarah stands immovable in the shadows. Little Isaac offers his own cloak to his brother Ishmael as the older boy and his mother are ejected into the wilderness. Ishmael turns back not to his father Abraham but to his little brother. Hagar was a lovely young slave belonging to Sarah, the powerful wife of Abraham. 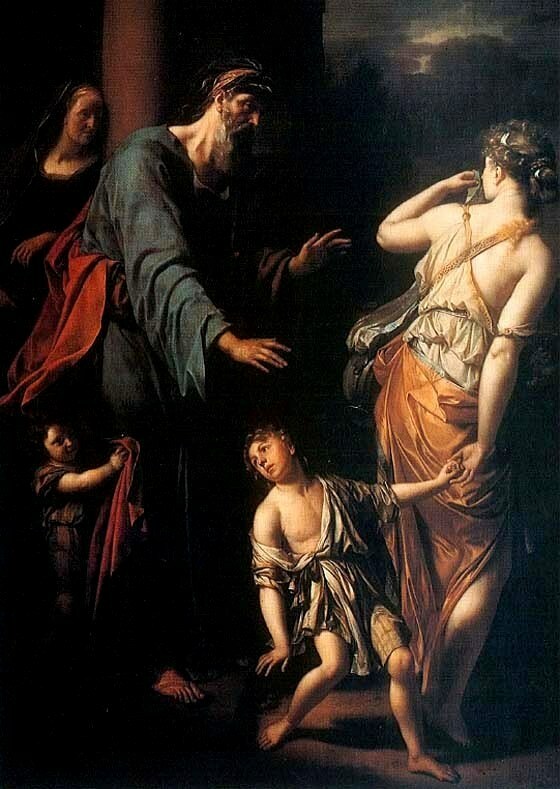 Sarah had never had a child, so she decided to give Hagar to her husband, to be a surrogate who would have his child. Legally, the child would belong to Sarah and be Abraham’s heir, and Hagar could do all the hard work of bearing and looking after the baby. Everything went to plan, and Hagar became pregnant. But the girl did not know her place, was not as subservient to Sarah as she should have been. Airs and graces, thought Sarah. The former queen-bee of the tribe felt threatened, probably quite frightened of the power this former slave now had. It was not just that she resented the ‘nouvelle’. This girl might be carrying the future head of the tribe, and if so she would replace Sarah as chief woman in the tribe. Sarah realized she had lost control of the situation. 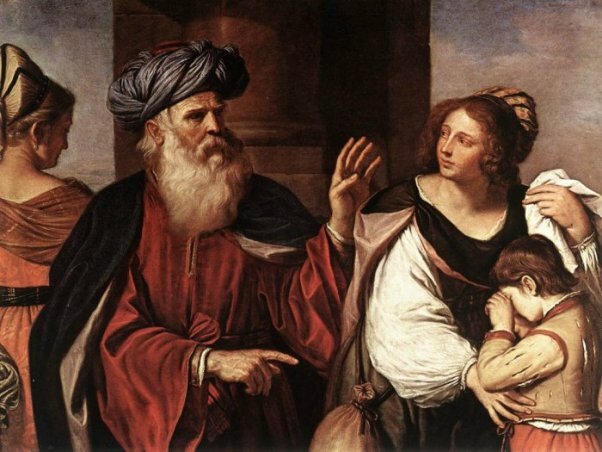 We don’t know exactly what Sarah did to Hagar – the Bible just says she ‘mistreated’ her, but the heavily pregnant girl fled out into the wilderness, apparently trying to return to her family in Egypt. On the way, beside a spring of water, she had some sort of mystical experience. An angel appeared to her, blessed her, and told her to return to Abraham. The angel promised that a great people would arise out of the tiny baby she carried in her womb. So Hagar returned to Abraham’s house, and had a son whom she named Ishmael. For a while there was an uneasy truce between the two women. The boy grew up, and Abraham circumcised Ishmael when he was thirteen. The next year, to the astonishment of everyone, Abraham’s aged wife Sarah became pregnant with his second son, Isaac. As soon as she held the longed-for baby in her arms the rivalry between the two women flared up again, and quickly became intense. They soon ran out of water and began to die. Hagar could not bear to watch her son dying of thirst, so she put him under the only shade she could find and crawled away to die. 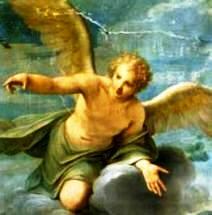 But again an angel appeared to help her, showing her a spring of water. She and the boy were saved, and lived on in the wilderness of Paran, where Ishmael became an expert in archery. Hagar never returned to the tribe. When the time came she arranged that her boy marry an Egyptian woman, not a Hebrew. He had many sons, who in turn founded many tribes that settled in all the area from Assyria to the northern border of Egypt. Hagar is seen as the foremother of the Arab nations. 1 Now Sar’ai, Abram’s wife, bore him no children. She had an Egyptian maid whose name was Hagar; 2 and Sar’ai said to Abram, “Behold now, the LORD has prevented me from bearing children; go in to my maid; it may be that I shall obtain children by her.” And Abram hearkened to the voice of Sar’ai. 3 So, after Abram had dwelt ten years in the land of Canaan, Sar’ai, Abram’s wife, took Hagar the Egyptian, her maid, and gave her to Abram her husband as a wife. 4 And he went in to Hagar, and she conceived; and when she saw that she had conceived, she looked with contempt on her mistress. 5 And Sar’ai said to Abram, “May the wrong done to me be on you! I gave my maid to your embrace, and when she saw that she had conceived, she looked on me with contempt. May the LORD judge between you and me!” 6 But Abram said to Sar’ai, “Behold, your maid is in your power; do to her as you please.” Then Sar’ai dealt harshly with her, and she fled from her. 13 So she called the name of the LORD who spoke to her, “Thou art a God of seeing”; for she said, “Have I really seen God and remained alive after seeing him?” 14 Therefore the well was called Beer-la’hai-roi; it lies between Kadesh and Bered. 15 And Hagar bore Abram a son; and Abram called the name of his son, whom Hagar bore, Ish’mael. 16 Abram was eighty-six years old when Hagar bore Ish’mael to Abram. 8 And the child grew, and was weaned; and Abraham made a great feast on the day that Isaac was weaned. 9 But Sarah saw the son of Hagar the Egyptian, whom she had borne to Abraham, playing with her son Isaac. 10 So she said to Abraham, “Cast out this slave woman with her son; for the son of this slave woman shall not be heir with my son Isaac.” 11 And the thing was very displeasing to Abraham on account of his son. 14 So Abraham rose early in the morning, and took bread and a skin of water, and gave it to Hagar, putting it on her shoulder, along with the child, and sent her away. And she departed, and wandered in the wilderness of Beer-sheba. 15 When the water in the skin was gone, she cast the child under one of the bushes. 16 Then she went, and sat down over against him a good way off, about the distance of a bowshot; for she said, “Let me not look upon the death of the child.” And as she sat over against him, the child lifted up his voice and wept. 19 Then God opened her eyes, and she saw a well of water; and she went, and filled the skin with water, and gave the lad a drink. 20 And God was with the lad, and he grew up; he lived in the wilderness, and became an expert with the bow. Sarah, the former queen-bee, felt threatened. She had lost control of the situation.This girl might be carrying the future tribal leader in her belly. How did Bible people dress? It was the duty of the owner of the slave to look after his ‘property’ well, and there were strict laws about the treatment of slaves (Exodus 21, Genesis 17:12-12). The owner of a slave was allowed to beat the slave as long as no serious injury was done. If a slave died after being beaten, the owner was punished.